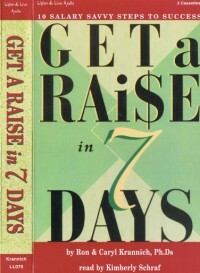 Here’s the step-by-step audiobook that outlines exactly what to do and say in order to get raises and promotions, filled with practical tips on how you can best talk money to power and come out a winner! Kimberly Schraf, has been recording acclaimed audiobooks for twelve years and has acted professionally in theaters ranging from Arena Stage and the Kennedy Center, to Scotland’s Deinburgh Festival. She is a graduate of St. John’s College in Annapolis.